My mortal body is often one of my most stringent usurpers of my soul’s control. Unfortunately, the whims of my flesh greatly influence my mindfulness of God’s benefits; how He has forgiven my iniquity, how he has healed me from sickness, how He has redeemed my life, how He has crowned me with steadfast love and mercy, how He completely satisfies me with His goodness. Sleep is a precious commodity. Ask any parent of young children and they will tell you that their one wish is for a complete night’s rest. I no longer have young children who disturb my slumber. As of late, I have a misguided internal clock that is more effective than any wailing infant. I have taken to awaking at 2:30 in the morning, tossing and turning until 4:30, only to have my alarm disrupt my dreams at 5:30. I realize that there are many who struggle with insomnia to a far greater degree than I. I am thankful not to face their struggle. This morning, I arose not very mindful of the benefits of my Lord. I was far more mindful of the benefits of sleep. It was a prolonged battle between soul and flesh, to drag my reluctant bones to my desk and open the precious words of God. I know that if I had remained in bed that God would not have loved me any less. I know that I would not have been punished if I had missed this time of meditating on His words. I know that God’s blessings are not contingent upon fulfilling my allotted time of reading my Bible, journaling and prayer. I know that sometimes it might be best to just get the rest. I also know that this is the most peaceful, refreshing, and renewing part of my day. I set aside this part of my day because I want to. I do not do it because I have to. I do it because as a child of God, I get to. It is when I allow my body undo control that I begin to forget the benefits of my Lord. I begin to think that the comforts that I feel are equal to the benefits of the glory of God. It is a sad state when a discomfort as minor as a little sleeplessness (I cannot even bear to call that suffering) is counted as worth some of the glory that is revealed through God’s word and by His Spirit (Romans 8:18). How His goodness has made me content with where He has placed me. My Lord has renewed my soul this morning more than any sleep could do. The slight glimpse of His spectacular glory was so worth the two hours of sleep that I lost. I look forward to what He has for me tomorrow. We had a strong storm blow through not that long ago. It was a cold driving wind that turned rain drops into stinging projectiles. In a pasture along the road home, I saw several horses out in the storm because they had no shelter. They had pointed their backsides into the wind, hunched their backs, and dropped their heads. Since there was no escape, they were miserably enduring the storm. I was thinking about those poor beasts as our garage door automatically opened and we silently slipped into the refuge of our home; fully protected from the ravages of the storm. I was very appreciative of my house. It would have been silly of me to park outside our garage. It would have been even sillier to seek refuge under one of our leave-less shade trees. I would have quickly been as miserable as those horses. I would have been a fool since I had an escape to refuge only feet away. You can have a refuge but you have to go in. A strong tower is only of value if you are inside of it. However, we are told in Luke 14:28-29 that there is a cost to strong towers. There is an issue with entering the strong tower of the Bible. It is like getting through security at the airport. You are not going to get through with prohibited items. We cannot enter the strong tower of our Lord with the prohibited passions of this world. “So therefore, any one of you who does not renounce all that he has cannot be my disciple.” Luke 14:33 We have to lay aside all of those things that we value more than the Rock of our salvation. Sadly, many are miserably bewildered as they are caught in a raging storm of our enemy, just outside the refuge of our Lord, clutching their trinkets. Come inside, where the enemy cannot reach you. It is so much better than miserably enduring. There is no trinket of this world that can match the treasures that await you inside the strong tower of our Lord. It is our hope in the next couple years to take a family vacation to Washington, DC. There is just something about standing in the same place that history was made or walking through memorials that makes history come to life. My kids are studying a lot of US History. I want that history to be more than just stories in a book. We want it to mean something to them. I want it to be a reality to them. My wife and I visited that USS Arizona memorial in Pearl Harbor. One grasps a much deeper meaning to the word sacrifice and appreciation for what prior generations have given us, when you stand over the watery tomb of those who have given it all in the service of their country. 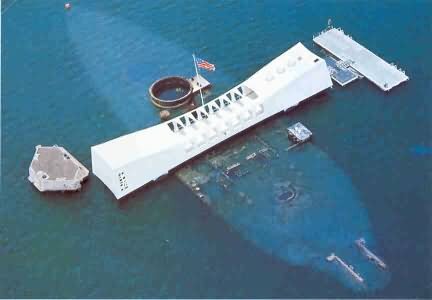 After having been there, Pearl Harbor means more to me. It is more than just a historical event by having stood there. It is a reality to me. That is the importance of memorials. They are important because we have short memories. They are important because what was real and relevant for one generation is usually less relevant to the next. This fact is even more important when we consider our faith. I don’t want my kids to live through my faith. I want them to come to their own passionate love of God. There is a process that should concern every parent. There is about a three generation cycle: one generation will be passionate about the faith that they have experienced directly; the next generation is luke-warm and follows the faith of their parents; the third generation falls away. This cycle makes me concerned about my kids and especially about my future grand-kids. However, this cycle is not written in stone but it takes effort to break. It can be broken with memorials. I need to be making specific efforts to create memorials in my life and the life of my family to ground us all in the reality of God’s faithfulness. I need to be active in pointing out to my kids that God is more than the abstract faith of their father. When God gets us through something tough, we need to make a memorial so that we will remember. When God blesses us, we need to make a memorial so that we will remember. These little reminders (a photograph, a nick-nack, a journal, etc.) are teaching opportunities for our kids. They are stones that will get our kids to asks, “What does that mean to you?” Stones that will make the faith of one generation more of a reality to the next. Our kids are watching our lives. We are creating stones of memorials all the time to that which is important in our lives. Ask any adult child, “what was important to your Dad; what was important to your Mom” and they will be able to tell you. That is because every parent leaves stones of memorials to their priorities. The manner in which we live our faith is our kids normal. They will pattern their lives based on what we demonstrate as important. I want my kids to see a faith that is real so that they will seek a relationship with God that is real, deep, passionate…alive. I want my kids to live a life full of stones of memorials that get their kids, my grandkids, to ask, “what does that mean to you?”. That is a true legacy but legacies start in the present. It is time to gather some stones today. I know that many people struggle with their weight. There can be many factors that lead to obesity but the equation remains maddeningly simple. When we consume more calories than we burn, we get fat. The problem for me is that I often don’t even realize how many calories I consume. Usually, the only consequence is tighter pants. Recently, there were dire consequences for a woman in Hungary. According to the NY Post, an obese woman, on vacation in Hungary, was not able to physically fit into an airplane and return to the US for kidney treatment. Tragically, she died in Hungary. I wonder if she had known that her weight would prevent her from being able to enter that airplane if she would have gotten that weight off. We will never know. She waited too long to get prepared for the trip. There are consequences to being over-weight. However, most folks never anticipate dire consequences due to their weight. That is why current polling shows that people are happily fat. We get content with being over-weight because it is harder to be fit. I lost 35 lbs this last year. It wasn’t because I started exercising. I had completed P90X and Insanity but had gained 3 lbs. It wasn’t until I started tracking my diet that I began losing weight. It is simply amazing how a handful of nuts here, a little sliver of dessert there, and a bit of extra serving on top can add up. I started to log everything that I consumed. That resulted in me being aware and limiting what I was shoving into my mouth. It was then that all of my exercising began to have the effect that I had been hoping for. The weight just came off. This got me to wonder how many folks are spiritually over-weight. All you have to do is take a quick look through today’s churches to see a lot of spiritually out-of-shape Christians. I wonder how many of them are not even aware of the volume of worldly desires that they are daily consuming. We can follow very rigorous spiritual disciplines but we also have to limit the corrupting delicacies of this world that we consume. There is a balance between spiritual exercise (doing) and diet (delighting) that every believer must find in order for them to experience spiritual fitness. To be in shape, you have to strive for it. You have to be earnest for it. That is what Jesus is telling us here in Luke. We need to strive, to be earnest, about salvation. How much earnestness do you see out there? How much earnestness do you see in yourself? I see a lot of luke-warmness (Rev. 3:15-17) and that scares me. Many people believe that they have a ticket that allows them passage to heaven. We are warned that many of these people are going to show up at the narrow gate and find that they don’t fit. Just like the majority of Americans who are happily fat, there a many Christians who are happily fat spiritually. They don’t think that there are any consequences. They said a magic incantation and gone on consuming the sweet desires of this world. That is why we are told to examine ourselves. It is when we truly respond to the gospel that we are changed. The result of that new life will be a change in our palette. We will desire the things of God. We will gain assurance in our own salvation by seeing the Spirit work in our lives; by seeing the fruit of the Spirit growing in us and making us something that we weren’t. What scares me is that many will wait too long to get prepared (Matt. 25:1-12). The world is full of people who are on the wide and easy escalator that leads to destruction (Matt 7:13-14). Many of those people think that they are holding a ticket to heaven. It is time to get in spiritual shape. Examine yourself (2 Cor. 13:5)– maybe it would be good to start by tracking just how much of this world that you are routinely consuming. What do you desire the most? Where your treasure is, there your heart will be also. (Matt 6:21). I have thought that it must have been much easier to live by faith back in the day when they just heard God’s audible voice. If I just audibly heard God speak to me, then I am sure that I would have so much more confidence to step out in faith. They had it so much better. If that were the case, then why did God have to encourage Joshua to be strong and courageous? Joshua was no coward. He was a soldier, a warrior, who had been fighting for over forty years. God needed to encourage Joshua because he knew that Joshua was going to have to take the promise land based on faith, the same kind of faith that we interact with God on today. Faith requires a leap and it always has. We so often think of faith as a noun; “If you have faith…”. That is a noun. However, we cannot see what we have until it becomes an action. Joshua was going to come up against powerful people in walled cities. It was going to be faith – faith in God’s promise – that would allow the word, “Charge”, to escape his mouth. The action of moving forward was a demonstration of Joshua’s faith and that takes strength and courage. Strength and courage is always needed when we decide to leap based on faith. We have a chance to experience faith every day. James tells us in James 2:18, “Show me your faith apart from your works, and I will show you my faith by my works.” Leaping (faith) is shown in our works, which shows our faith. It is wonderfully circular. When we leap, we move from observer to participant. Do not be fooled. That requires courage. The Bible takes that for granted; just look at all of the passage in the Bible telling us not to fear. Faith takes strength and courage. There are many folks who live their every days lives without much need of courage…could it be that they are mere observers? When was the last time that you needed courage? So often, we seek the safe, we want guarantees; the result is that we never see true faith. It is no wonder that we can feel distant from God. Faith is just theory when it is not in action. The reality is that you will never truly experience God on a personal level until you participate. There are a lot of God observers but God has a relationship only with those who are willing to participate and that takes courage to leap. Therefore, be strong and courageous, do not be frightened, and do not be dismayed, for the Lord your God is with you wherever you go…now, jump! According to Steve Cochrane in an article for Tech Republic, you should avoid Russian tractors if you’re in the tractor market. 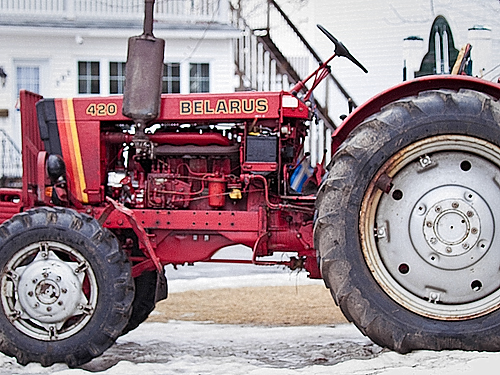 At least you should strike soviet-era tractors from your list. That is unless you enjoy doing mechanic work on tractors, then this might be the tractor for you. The soviet tractor was the product of a mindset that did not value continual improvement and quality. There was no competition, only quotas, so design rarely changed and flaws persisted. They just kept doing what they did to meet the expectation of the state. The result was a product that did not fail to disappoint. Russian farmers had to continually invest their limited income into repairs of an inferior product. The contrast is a vehicle manufactured by Toyota. Toyota is a company with stringent quality control. They are continually seeking to improve their product and maintain a high level of quality. Toyota has even developed their own production method called “lean production” and the result is a vehicle that rarely disappoints. It is why a Toyota is… well, a Toyota. I was wondering how you would describe your faith; would you describe it like a Russian tractor or a Toyota? There are folks who just continually struggle in their faith; it seems like their spiritual lives consistently fall apart on them. They seem to spend all of their time working on themselves and can never be used. They practice their faith in a manner to simply please the expectations of others. They seem like a Russian tractor. That may be due to a fundamental flaw in their mindset. Many folks “get saved”, mark it off their bucket list and just keep doing what they have always done. “Getting saved” is only the start of the Christian life. It is the start of a life of continual improvement and an obsession on quality control that in Christian talk we call sanctification. However, sanctification, like quality, doesn’t just happen. 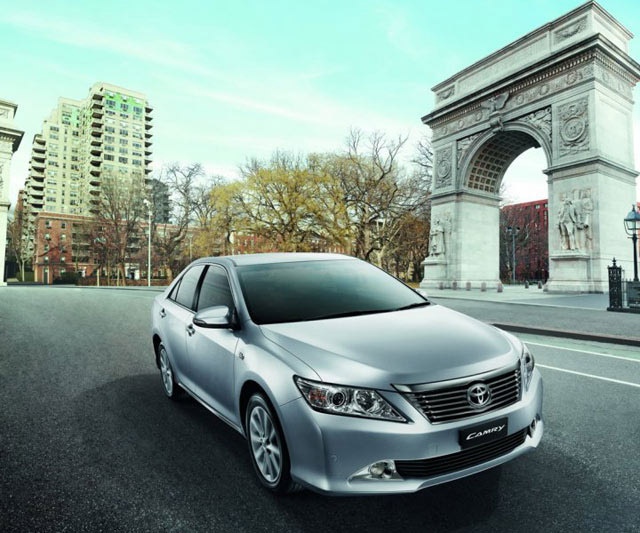 Toyota has invested billions into their production process to get the results that they now enjoy. The soviets never did and now they are gone. We need to be willing to invest in our own sanctification. That means we need to be willing to put the time in. Sanctification is a work of the Holy Spirit but that does not free us of responsibility. We can’t just keep doing what we do. We need to knock, seek, and ask. All of those words are verbs; action words. When we do all of those actions with our Father in heaven and He will never fail us. We will never be let down by our Father when we invest in our own sanctification. There may be some folks that go – how? I have been there and have been discouraged by trite answers. I have wondered how this all works because I am tired of being…me. Maybe, the tools of Toyota’s lean production process can lend us truths in the pursuit of quality in our faith. Sort through items keeping only what’s needed: Let’s face it; our lives are full of things that we don’t need. There are some things that simply have got to go. They are keeping you bound to this world. They are sources of unholy desires that simply have to be removed because they will continually bring you down. All things are free to you but all things are not beneficial. You know what those things are. It is time to deal with them. Straighten – a place for everything and everything in it’s place: Organize your life. As an example, if you find it difficult to have a consistent time in prayer and Bible reading, then organize it. Set aside the same time every day. Don’t try and fit it in; you will never find the time. Get all your Bible stuff in the same place. We can find all sorts of excuses to get up and waste the precious little time that we have. Do this sort of organizing throughout your life and you will be amazed at the consistency that will come from it. Shine – cleanliness: Be passionate about purity. It can be so discouraging to fall into that same old sin. Be quick to go to our Father and confess that sin, once again, and be reminded that your sins are forgiven (cleansed), and turn to him (setting your mind on the Spirit) ; become a spiritual neat freak. We can become comfortable with filth in our lives. We need to check our desires and continually clean. We live in a corrupting world that can cling to us like dirt. We need to continually be cleaning the desires of our heart and setting our minds on the things of the Spirit. Standardize – develop systems and procedures to maintain and monitor the first three: We need to create an examination process in our lives that helps us evaluation how we are doing. This takes humility. We need to remember that we have never “made it”. We are all works in progress. I think that it is healthy to daily evaluate: do I need to sort through things, standardize, clean. A heart that desires Christ more than anything else should always be humbly seeking the Father to make sure we are still moving; constantly desiring more and wanting to go deeper. Sustain the new level of performance: Many Christians have this idea that the Christian life is a rollercoaster. That is a defeatist trap. Sanctification is a work of the Holy Spirit; it is a gift of our Father that he gives us when we seek him. Why would that go up and down? That doesn’t mean that we will not experience disappointment and suffer. However, circumstance should not affect our maturity. It should enhance it. We need to have an expectation that this new level of fellowship with our Father is the norm. If it even begins to wane, we need to fight to sustain the new normal for our lives. Dig in and fight for it; don’t be content with the way it has always been. When we get serious about our own faith, we will find that we can have a faith like a Toyota. A faith that will never fail us. All we need to do is start by asking, seeking, and knocking and our Father will give it to us. Our Father is the best Father ever. He knows how to give good gifts. “If you then, who are evil, know how to give good gifts to your children, how much more will the heavenly Father give the Holy Spirit to those who ask him!” (Luke 11:13) Do you believe that? Claim it! Do it! Prove it! Take God at his word and you will never be disappointed in his faithfulness. Diplomacy fascinates me. I am amazed by the volume of words that can be used to say nothing. At least, it appears that they are saying nothing. Diplomats speak in a language all their own. I realized, after reading Henry Kissinger’s book Diplomacy, that diplomats usually don’t “wing-it”. They have committees that agonize over the use of precise words in the crafting of every diplomatic statement. Problems tend to arise in international politics when a diplomats carefully selected words are viewed as empty. There have been dire consequences for mistaking real intent as empty words. Hilter laid out exactly his intentions in Mein Kampf. The whole world suffered from thinking that he didn’t really mean it. Stalin and Kim Il Sung interpreted a speech by then Sec. of State Acheson as American intentions to defend the Korean peninsula as empty words. The Korean peninsula is still paying the price of that miscalculation. I don’t know of any other words that have been more misinterpreted than the Bible. There is a significant amount of theology out there that is based on the premise that God couldn’t have meant that – they must be empty words or they must mean something different. That is a dangerous mindset. I have a tendency of approaching my Bible reading seeking the parts that are “for me”. That implies that there are parts that are not “for me”. That is a dangerous mindset. God’s word is more carefully crafted and designed than any diplomatic policy. I need to remember that all of God’s word is a gift. There are no empty words within it. All of the Word of God has been given for my very life. It is not a self-help tool – it a self-preservation tool. God is not engaging us in diplomacy. He is not negotiating with us. God warned the Israelites what would happen to them if they mistook his warnings as empty words. It did not work out for them – God did what he said he would do. The Bible continues to have plenty of warnings for our current time. They are not empty words. Empty words do not exist in the Bible. God says what he means and means what he says. How we respond to God’s warnings reveals whether we think his words are empty or not. Do not expect a de’tente with God. It is your very life that you are playing with.